Candi Kecil Tiga is a charming and tropical 3-bedroom villa hidden away in the beautiful surroundings of Ubud. You are welcomed in the sunny garden where a private swimming pool glistens invitingly, fringed by lush tropical greenery. Soak up the sun on the reclining chairs, go for a swim, everything is just perfect for relaxation and fun, spending precious quality time with loved ones. The living room is tucked in a tropical open-air pavilion from where you can easily dive into the pool. All three bedrooms are designed and decorated for luxury and comfort. 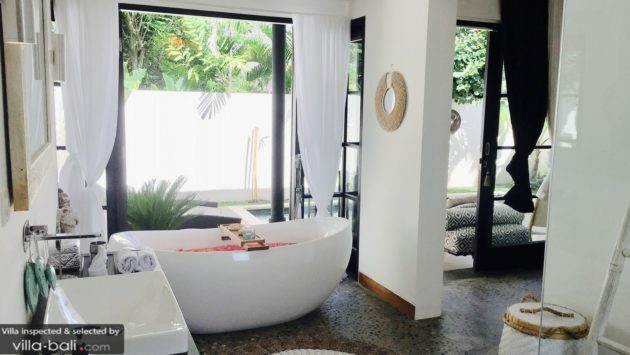 You will have access to a private open-air en-suite bathroom in all bedrooms. How does a bath beneath the stars sound to you? 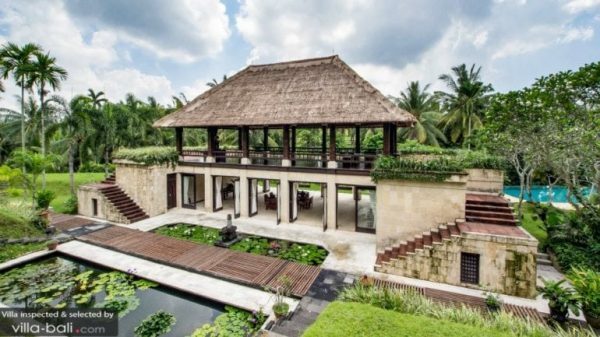 This villa is found in the Pejeng village, a short 15-minute drive away from the center of Ubud. Go see the highlights of Ubud such as the Goa Gajah Elephant cave, the water temple Tirta Empul and the Luwak coffee plantation. Prices start at US$270 (low season), US$300 (mid-high season), US$330 (high season) and US$350 (peak season). This gorgeous 5-bedroom holiday home, hidden away in a raw tropical nature of Ubud, is everything you have ever dreamt of and more. It is located right next to a deep river valley, and yet, it is just a 15-minute walk to the center of Ubud. It is a great place to recharge your body, mind and soul and connect with family and friends, with plenty of facilities availabe. You will love your time here. A lovely 15-minute walk through the rural life and unspoiled nature of Bali leads to the cultural heart of Ubud. Another 15 minutes drive up North will take you to the Sacred Monkey Forest and King’s Palace where you can watch an enchanting and entertaining Kecak dance. A lot to explore around here! Prices start at US$750 (low season), US$795 (mid-high season), US$865 (high season) and US$980 (peak season). This charming 4-bedroom villa blends the contemporary with the traditional elegantly. 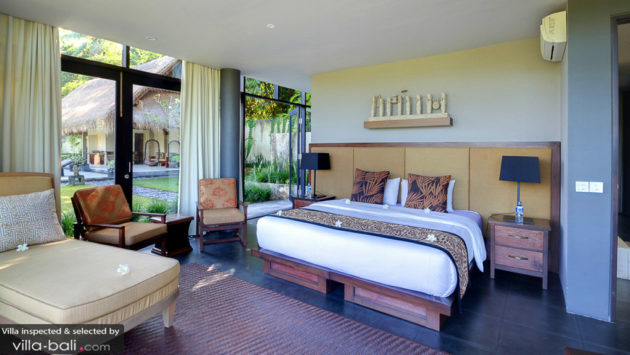 Balinese charm exudes throughout the compound and yet all modern comforts and facilities are provided. The spacious living room, featuring a high soaring rooftop, features all kinds of traditional artwork and sculptures. Climbing the stairs up leads to a wonderful open-air terrace where you can practice yoga, enjoy a relaxing massage, play pool or just lounge and chill with friends and cocktails. The garden is also lovely, featuring a private swimming pool with a shallow area for the kids to splash around. The master bedroom is massive in size, furnished with beautiful intricately-carved furniture and adjoined by a big open-air bathroom with a terrazzo bathtub and a rain shower. The three guest bedrooms are in a separate pavilion, all perfectly comfortable and each with a private en-suite bathroom. 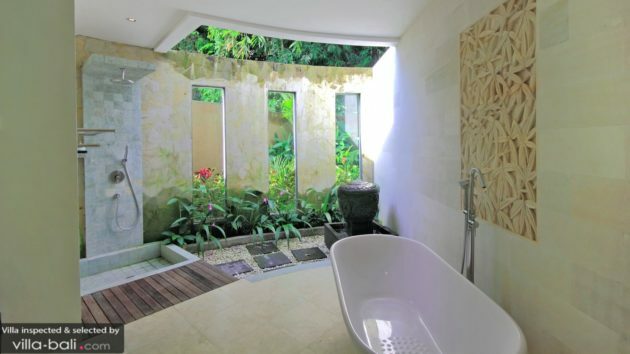 The villa is located in a quiet, rural area, just a 15-minute scenic drive from the heart of cultural Ubud. In the surrounding neighbourhood, you can wander around in the rice paddies or go rafting on the Ayung River. Prices start at US$440 (low season), US$460 (mid-high season), US$490 (high season) and US$540 (peak season). 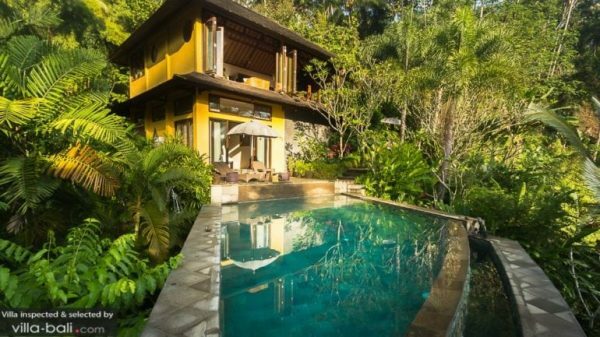 As you can see in the photos, obviously Villa Amrita has all the facets of a hidden blue lagoon, tucked away in the rainforest that surrounds Ubud. Swimming in the stunning free-form infinity pool and leaning over the edge to gaze into the jungle gorge is an amazing experience! 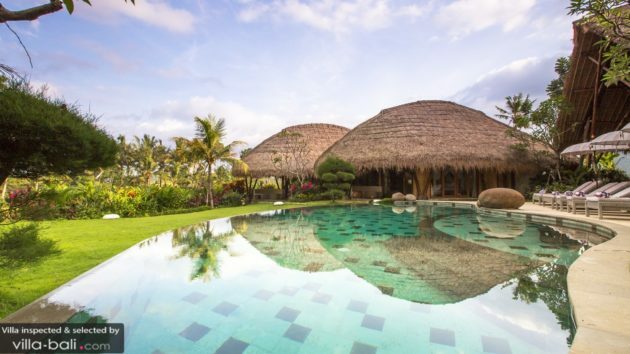 Villa Amrita features tropical ‘alang alang’ thatch-roofed pavilions exuding tropical charm. Inside, the living room and bedrooms feature stylish contemporary designs and modern facilities including a state-of-the-art kitchen with an espresso machine. Guests can choose to dine indoors or outside in the alfresco dining bale. Wonderful! There are 3 well-appointed bedrooms with air-conditioning and satellite-TVs. The master suite even boasts a jacuzzi tub to relax in at the end of the day. The villa is located in the village Keliki, a beautiful and utterly peaceful area in between the lively spiritual town of Ubud and some of the cultural highlights in the surroundings of Ubud such as Gunung Kawi and the water temple complex Tirta Empul where you can do a ritual bathing yourself, if you wish to do so. Beautiful circular thatch-roofed pavilions are just some of the features that make Villa Omah Padi unique and gorgeously beautiful. This 5-bedroom Balinese luxury retreat is surrounded by rice paddies and yet it takes just minutes to drive into the center of Ubud. The estate exudes sophistication and tropical charm, crafted by hand with natural materials in harmony with nature. Antiques and tribal artifacts add a unique touch to your stay. The views of the lush garden, tranquil ponds and the overflowing swimming pool are just wonderful! Villa Omah Padi is one-of-a-kind and simply breathtakingly beautiful! Families with kids are most welcome. There is a shallow wading area in the pool for the little ones to splash and play and two of the bedrooms are interconnected, creating an ideal family compound for parents with kids. All bedrooms have air-conditioners and satellite-TVs. The location of Villa Omah Padi is just perfect if you want stay somewhere peaceful and quiet, yet close to the most cultural town in all of Bali. A best-of-both-worlds case, indeed! Prices start at US$544 (low season), US$654 (high season) and US$764 (peak season). Expansive, beautiful, luxurious, overlooking rice paddies and the jungle valley, Villa Vajra is another hidden gem of Ubud. Villa Vajra features a lofty open-plan living room furnished with gorgeous teak wooden furniture, antiques and traditional artwork. Modern amenities are also provided in the air-conditioned media room. Here, you will not only find a state-of-the-art entertainment set but also plenty of board-games for old-style family fun. The garden not only features a most inviting swimming pool with a waterfall feature but also a jacuzzi. On top of that, the villa features a private fitness room and a yoga practice area. You won’t see much else than rice paddies and some villages in the nearby surroundings of Villa Vajra. A great escape from daily life. 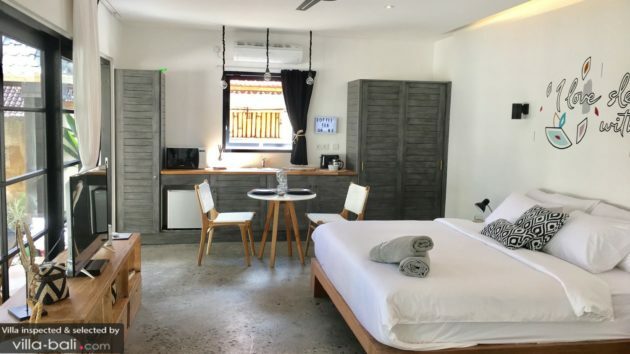 However, if you are up for some action, you can go rafting on the Ayung river, explore the nearby caves and temples or drive straight to the center of Ubud to do some shopping, watch a Kecak dance and eat exquisite healthy food at one of the raw food restaurants. This villa is perched on the edge of a lush green valley where the sacred Pakuseba River rushes through. No matter where you want to hang out within this beautiful luxury retreat, the views are enchanting. 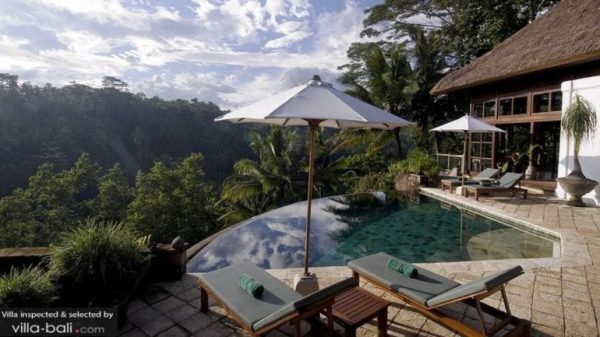 Go on, plunge straight into the infinity pool and swim towards the edge for the best valley view. It is amazing! Apart from the views, Villa Kelusa boasts 3 living areas, providing guests with lots of space to enjoy each other’s company as well as places to find solitude. Traditional and ultra-modern designs are infused, providing guests with the best of both. A state-of-the-art gourmet kitchen and a dedicated media room are part of the package and the staff is just wonderful! Ask the staff to take you on a wonderful tour around the villa. They will be happy to show you around these magical lands of rice paddies and jungle rivers. 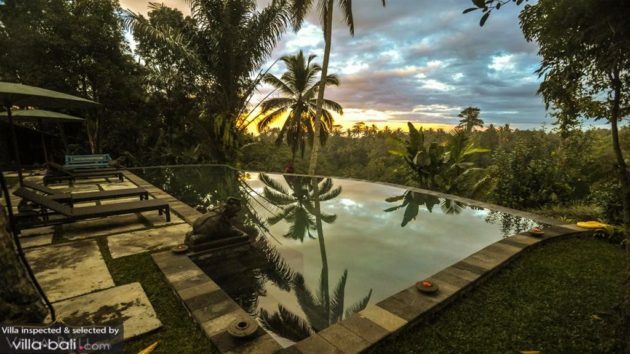 Spiritual Ubud awaits you, around a 30-minute drive from the villa. Prices start at US$685 (low season), US$914 (high season) and US$1029 (peak season). 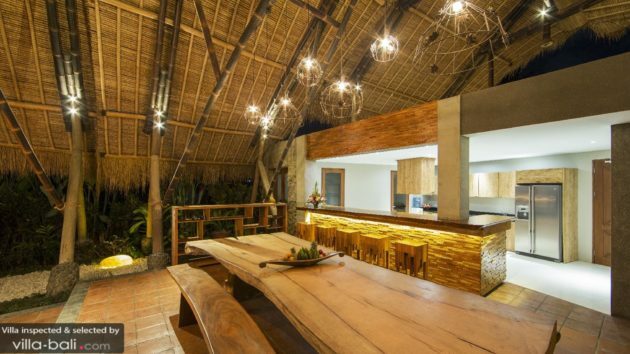 This soulful jungle retreat brings you back to nature! 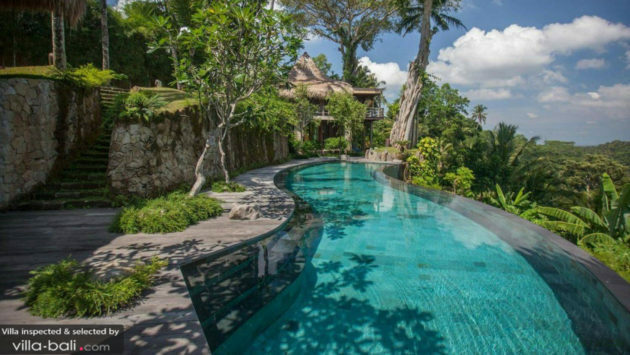 Featuring traditional Javanese Joglo-inspired houses, a garden on the edge of the deep gorge and a stunning curvy salt-water infinity pool to plunge into. 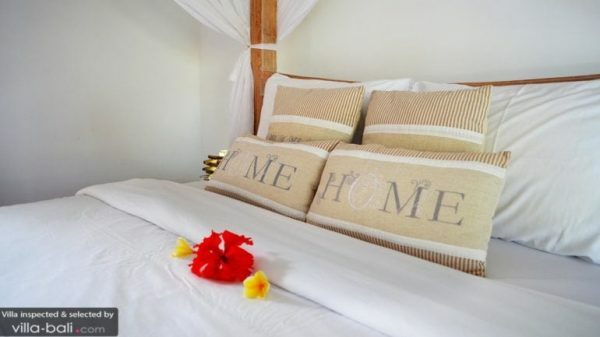 Villa Bodhi rental is rustic and charming, designed beautifully with antiques and tasteful artwork. Guests can lounge on the antique sofas and daybeds and even enjoy dinner while gazing at the stunning views of the valley. 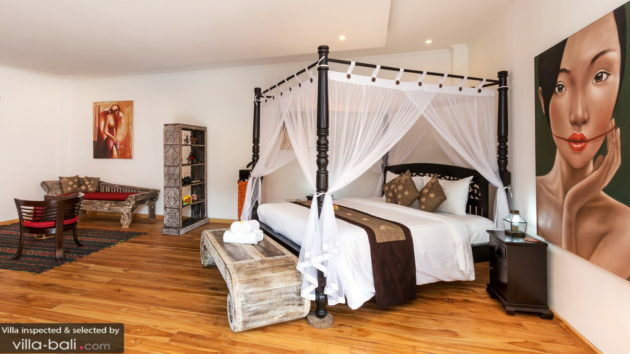 All 4 bedrooms are ruled by custom hand-carved wooden furniture, artwork and oriental carpets, creating chic and sophisticated sleeping quarters to retreat to at night. Each of them is air-conditioned, adding modern comfort and they all feature satellite-TV for entertainment at night. 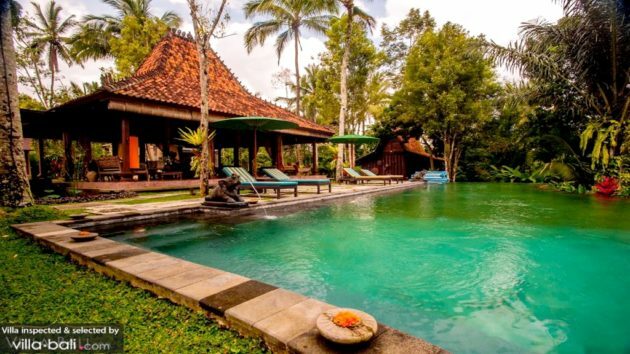 The quiet local village Bukian is where this villa is located, just 7 km from Ubud. The elephant safari park is only 2 km away, great for families with kids! Prices start at US$604 (low season), US$660 (high season) and US$776 (peak season). 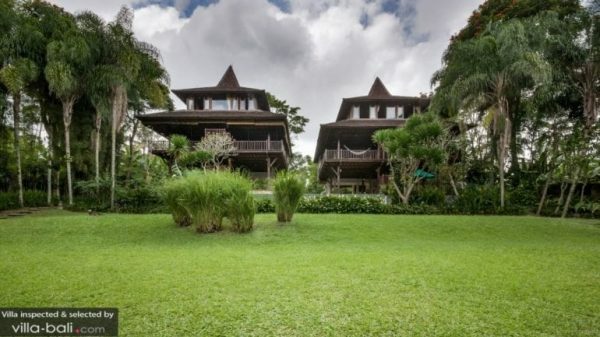 Villa Atas Awan, meaning ‘ above the clouds’ features two impressive handcrafted wooden pavilions, towering high up into the sky right next to each other, separated by the villa’s private swimming pool yet connected by a timber bridge. These 3-storey high traditional pavilions are unique in their designs and absolutely stunning! 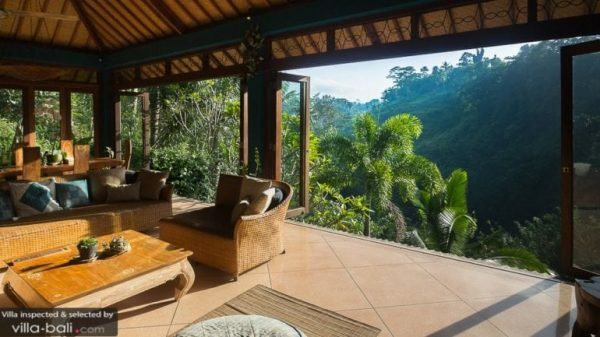 Villa Atas Awan houses no less than 7 bedrooms and with its spacious lofty living areas and its huge private tropical garden, this villa is perfect for organizing yoga retreats. There are plenty of places to sit and relax, be it on a sofa, sitting comfortably in a rocking chair or lazing in a hammock. The living areas on ground level, enjoy immediate access to the pool. 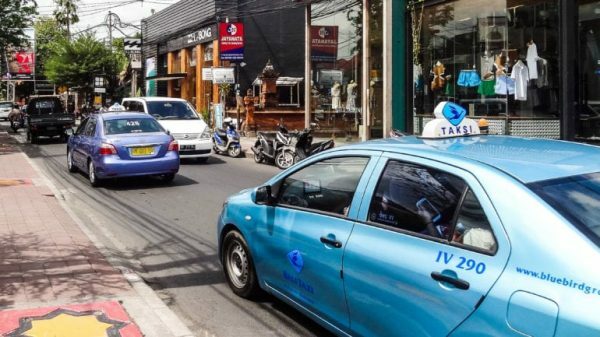 It takes a bit of a dive to get to the center of Ubud, but a shuttle service is offered complimentary, making it easy to go explore this wonderful little cultural town. During the 20-minute drive into Ubud, you will pass authentic Balinese villages and the landscape is of impeccable beauty! 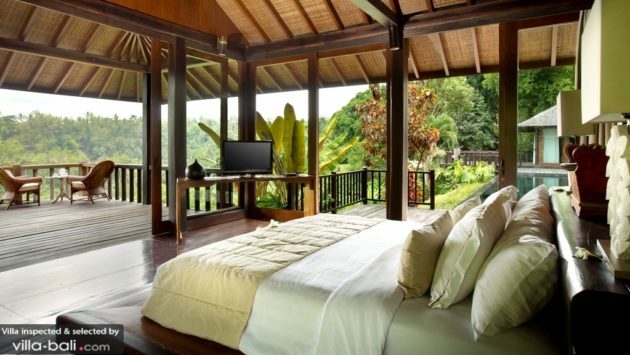 Your best Ubud villas list cannot go without Villa Melati. This 3 bedroom villa sits on the edge of the Sayan River gorge. A hidden gem of Ubud town at a just 5-minute drive away from its lively center. 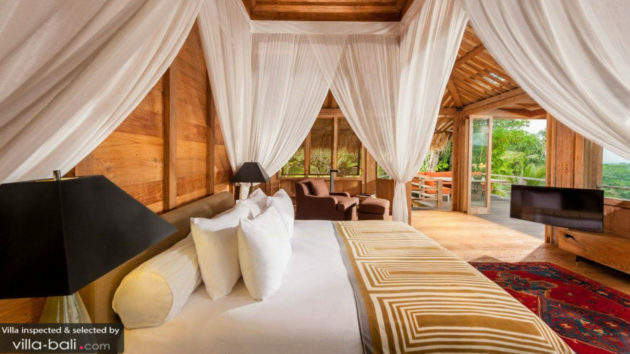 Beautiful tropical architecture, featuring teak wood and alang alang thatched rooftops, Villa Melati is a rustic nature retreat where you will want to stay forever. While enjoying a cool-down in the crystal clear water of the triangle-shaped swimming pool, you can see the sacred Ayung River streaming down below in the valley, surrounded by untouched nature. The living room splits up into a separate dining room and living quarters. Both living areas are beautiful with colonial-style furniture, antiques and rich Batik textiles. A cozy TV room is in a traditional Lumbung rice barn, doubling as an extra bedroom if you require. The location of Villa Melati is unbeatable. It feels far away from everywhere and yet, the center of Ubud is just a 5-minute drive away. Go explore the lively streets with health cafes, restaurants, spas, boutique shops and yoga studios. Prices start at US$598 (low season) and US$698 (peak season). Villa Kamaniiya is a majestic 5 bedroom holiday haven of unbelievable beauty! 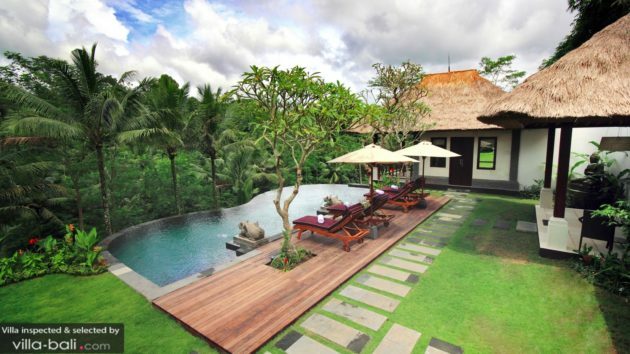 The compound is huge and it overlooks the lush green landscape of Ubud. 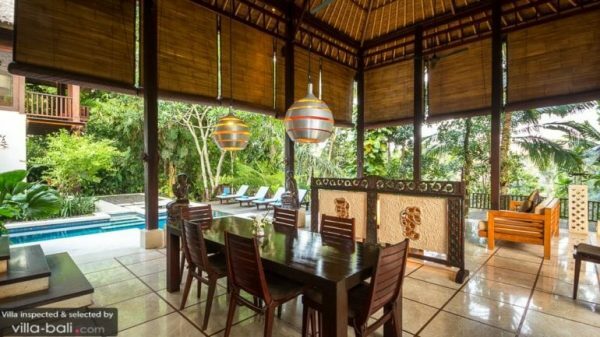 Traditional Balinese tropical architecture and an amazing team of staff to look after you, this villa is great for large families or groups of friends wanting to stay somewhere unique and traditional yet close to the center of Ubud. This villa not only boasts breathtaking views but is also has super cool features such as a treetop house, a wine cellar, pool table and a private spa. The 15-meter infinity pool forms the heart of the estate, surrounded by a wooden deck that is easily accessible from the well-appointed living spaces. There is a library room as well as a family room to watch movies. An amazing stay is guaranteed! While staying in the villa, there is nothing but the beauty of nature to calm your being, while outside, it takes just minutes to reach the buzzing center of Ubud where travelers come to sniff up some cultural, play with monkeys and find themselves through yoga and meditation practices. Prices start at US$1725 (low season) and US$1955 (high season). 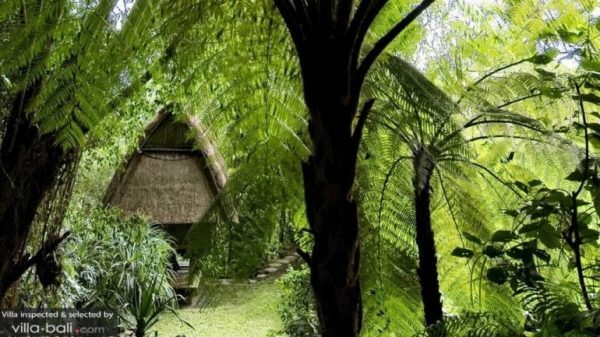 Umah Shanti is an idyllic 3-bedroom jungle villa overlooking the tropical greenery that grows lushly in a deep river valley near Ubud. This charming home away from home features a light-filled living and dining pavilion designed with floor-to-ceiling glass doors that slide open to the steep river valley, making it quite a unique place. A bit dangerous for families with young kids but amazing for couples and lovers of nature! The ambiance is utterly peaceful and serene. A lovely walk down the garden leads to the villa’s infinity pool where you can swim to the edge and peer straight down into the valley. 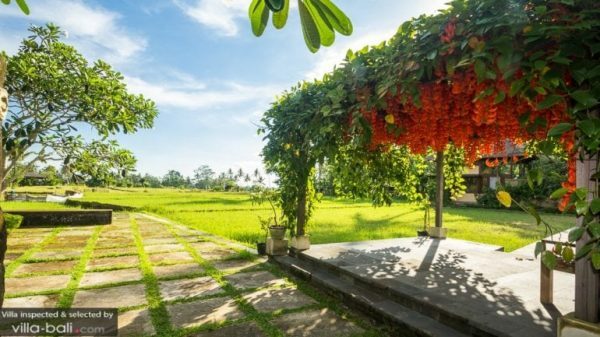 Away from the peaceful grounds of your private villa awaits the cultural town of Ubud where you can enjoy rice paddy walks, eat organic, see live music, practice yoga, encounter monkeys and go shop. Prices start at US$546 (low season), US$604 (high season) and US$661 (peak season). There is no other place like this on planet earth. This huge paradise retreat with 9 bedrooms, run by a complete dedicated team of staff of 29 is simply amazing. It is also ideal for art, yoga and meditation retreats. Traditional Lumbung houses are scattered around in the garden of this massive property. There is a yoga pavilion, a private spa, an amphitheater and a 22-meter infinity pool. In harmony with nature, this nature retreat is the perfect place to find inspiration and peace of mind. A stay at Villa Purnati Center Arts is a wonderful and unique experience you will cherish for all your life! 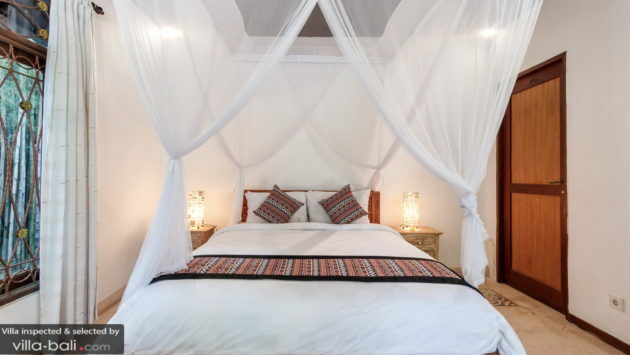 This retreat is located in between the center of Ubud and the Sukawati Art Market. The place where local artists and craftsmen sell their handmade wood-carved artwork, paintings, silver jewelry and more. 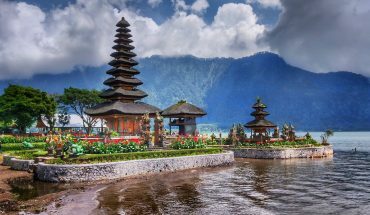 There are lots of things to see and do and you also get a good sense of the true authentic Bali with all of the rice paddies and Balinese villages around. Prices start at US$1150 (8 Bedroom) and US$1295 (9 Bedroom). A luxury stay in the wild raw nature of central Bali is what you can expect with a stay at The Hartland Estate. 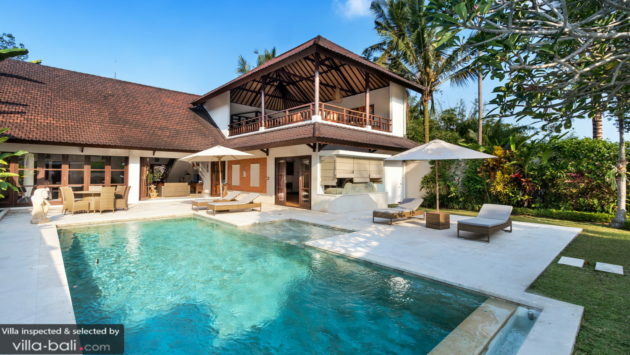 A glorious 5-bedroom villa on the border of Ubud town, stealing the heart of everyone who enters the compound. 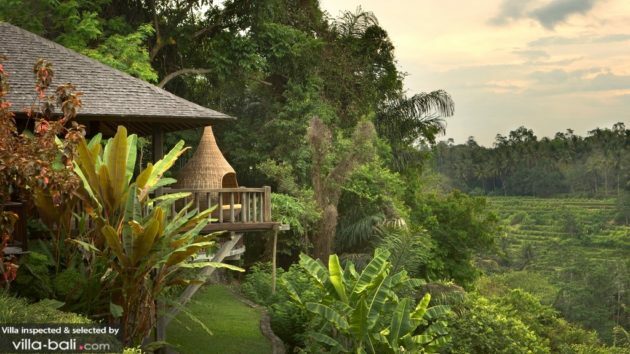 With views to blow you away, antique Javanese Joglo houses, meditation pavilions on the edge of the valley and two private master chefs that cook up delicious meals with veggies and herbs from the on-site organic garden, you are in for an amazing stay. Somewhere in the massive garden, beyond the towering palm trees and koi fish ponds, lies a private 26-meter infinity swimming pool that couldn’t look more inviting. Bedrooms are all stunning and unique in their designs. Each features stunning valley view to kiss you awake every morning again during your stay. 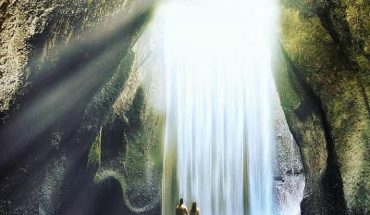 Even though it feels like you are finding yourself far away from everywhere, the center of Ubud is surprisingly nearby. Ideal for those seeking both tranquility and entertainment. Prices start at US$1351 (low season) and US$2021 (peak season). 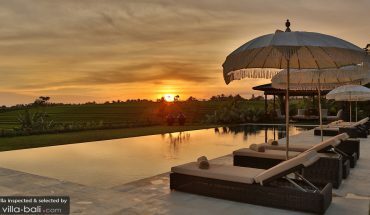 Villa Griya Atma is a lovely rice paddy retreat with all modern comforts and luxurious you could wish for. 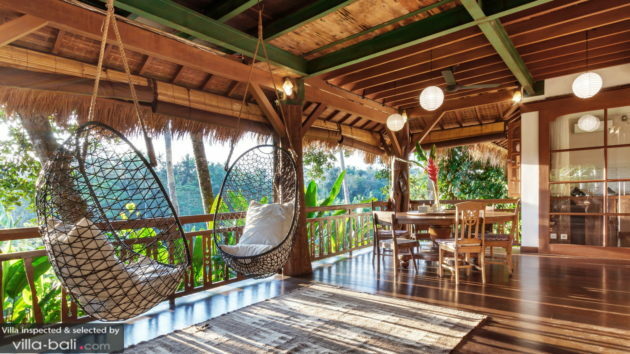 A lovely home away from home with easy access to Ubud and everything around this cultural town. The garden blends in perfectly with the rice paddies, leaving guests with a great sense of open space. You can swim in the infinity pool and gaze at this view that is iconic to Bali. You can also grab some cocktails, sit in the jacuzzi and wait for the sun to set over the island. This modern 4-bedroom villa features a light-filled air-conditioned living space, alfresco dining options and a family cinema room. Bigger traveling groups can rent this villa together with its little sister, the 3-bedroom Villa Griya Aditi for a 7-bedroom holiday haven on The Island of the Gods. 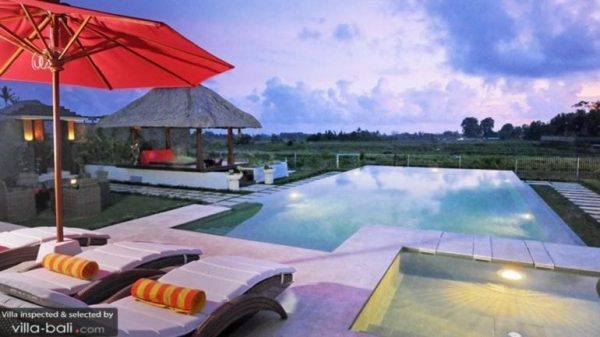 This villa is located just 7 kilometers away from the center of Ubud. Perfectly peaceful yet strategic. Prices start at US$506 (low season) and US$638 (high season). This is the ultimate getaway for romantic couples celebrating their love in a charming setting. 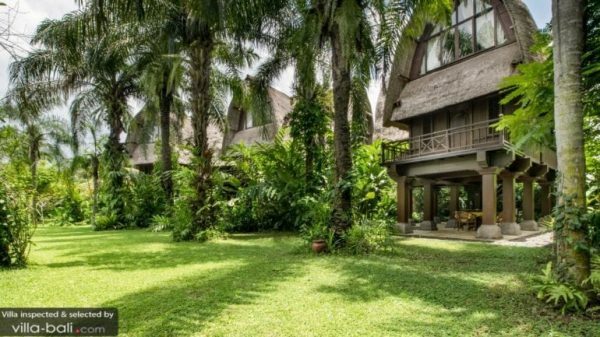 Adorned with tribal artwork, this 1-bedroom luxury villa is a peaceful retreat in a quiet Balinese village. Just within minutes away from the attractions in Ubud, every couple will love this place to bits! 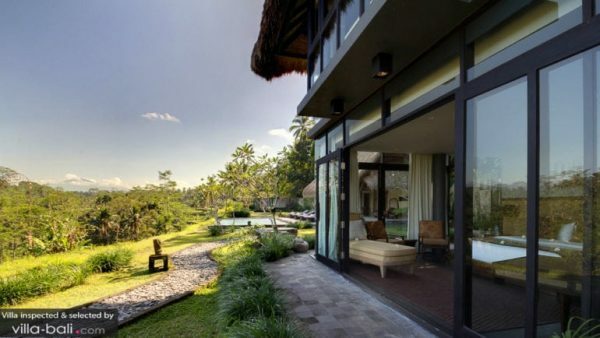 The villa is tucked away in the unspoiled nature of Bali, not too far away from central Ubud. Don’t miss out on a romantic dinner at Ubud’s La Rouge to complete this holiday of love on Bali Island. Prices start at US$145 (low season), US$175 (high season) and US$190 (peak season). Wondering what to eat in Ubud? Check out our recommendations!